Ruth Sanderson meets John Terry from Warwickshire. 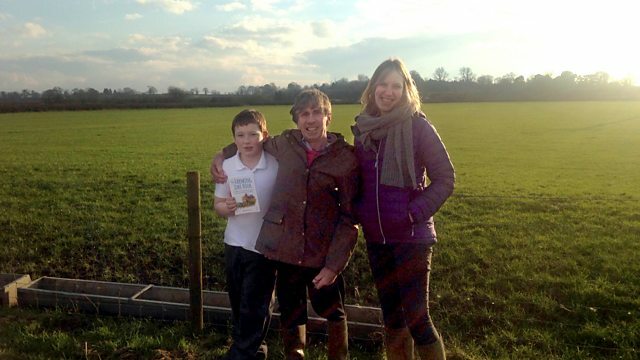 John is a teacher who has now achieved his dream of becoming a farmer and is hoping his books will inspire others do the same. John Terry always dreamed of being a farmer. After many years spent teaching he managed to create a school farm and with his savings he bought a small field. Today he farms 35 acres near Nuneaton in Warwickshire and his prize winning sheep are helping create herds across the world. Hoping to inspire others John has written children's books and the essential guide, 'How to Become a First Generation Farmer'. John tells Ruth Sanderson about his struggle to become a farmer and his hopes that his son will carry on his work. A sense of humour has been essential he says and has even inspired his latest endeavour - a joke book for farmers.